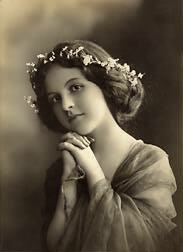 Olia Lialina: Jennifer, you didn’t say anything about yourself on the pages of Hollywood/Theater/5049/. Would you prefer to stay anonymous for this interview? Otherwise can you say some words about who you are and where you are from? Jennifer Pursley: I am from the east coast of the United States. I’m living in a larger city now than I was at the time I made my website. I am a nurse practitioner, which is basically an advanced practice nurse that can diagnose illnesses, prescribe medications, and other treatments as part of a medical team. I am finishing up a doctorate now. I do not have much of an online presence anymore. OL: How old were you when you started Star Wars vs. Titanic? JP: I believe I was 15 or 16. OL: The first capture on the Internet Archive is from February 1999, but the copyright is 1998, the content also suggests that it was not the first iteration of the web site. Do you remember when exactly you started? JP: I remember Titanic came out in December 1997 and I believe I would have made it probably January or February after that. So that was 1998, January or February, that was when Titanic was kind of at its height of popularity. I don’t know if you remember when it came out in the theaters. There were lots of people, everyone in school, going to see it, like three times, five times. It was a romance story and everyone loved it. OL: And we cried the rest of the night and, if not for other obligations, we would probably come to the idea to make a Leo fan page ourselves. JP: This film and fandom just really annoyed me for some reason. Despite the fact, I went to see it too, of course, which is kind of funny when you think about it. But the previous year – I don’t know how much do you know about Star Wars – Star Wars had had their 20th anniversary and they had re-released the original Star Wars movies in the theaters. So if you were someone at my age, you had never seen Star Wars in the theater before. So we got very, very excited about that. So we were all hyped up about that from the beginning of the year (1997)… and then Titanic came out. There were lots of people at my school that kept saying, oh, Titanic, is so much better than Star Wars. I said, you know what? No, it’s not, and I’m going to tell you why! OL: Was it your first ever web page or did you have another one before ? JP: That was my first time. Where I lived Internet was relatively uncommon for anyone to use it outside of, maybe school or in the library. Most people didn’t have a computer at home and my community, even in 1998. OL: Did you have any page after that or is it your one and only web site? JP: Believe it or not, that is the one and only web page I had. Later at university we had to do a really basic kind of website for a class. JP: Well, number one reason for a high school student: because it was free. And I also had seen other GeoCities websites. I liked how they looked. I liked the design and it seemed like a pretty friendly community too. There were lots of other people that looked like they were doing websites about things that they were a fan of and it just seemed like the right place. OL: Do you remember the moment when you chose the neighborhood? JP: Yes. Hollywood neighborhood and Theater suburb. I chose them because I was doing my site about Hollywood movies that were in the theater at that time. I do remember selecting it and then I remember looking at my neighbors’ web pages too. The ones that were just right around me. It was lots of little rectangles and you could click one that was empty to move in. OL: I had a chance to talk to David Bohnett recently, he was referring to this interface as a street map. JP: I remember I wanted to pick the block that had some nice neighbors around it. OL: Were you deciding because of the neighbors? JP: Exactly. It was like moving into a home. OL: The comment on the top of your index.html source suggests that your web site was <!–Created by GeoCities Home Page Generator–> But the code itself doesn’t look like you were actually using this generator. JP: I don’t remember how I made the page initially, but there were some communities that showed you how to build a website. And I think my initial layout I did copy from where they were describing how to make it. And then I would go in and tweak things inside of that. I was pretty clueless on how to make a website. A lot of people were doing frames then and that was a little confusing to me, since I didn’t really have the knowledge. My dad had a book called HTML for Dummies that I used as a reference quite a lot when I was typing things. I remember it being a free type. There were actually many GeoCities sites that had code on there to show you how to do it. And you could get some ideas from them. And they had some examples of code that you can use. And I think I got it from there, and the comment you mention was may be a part of that. OL: I guess every image you used on your site came from other web pages or free collections. Am I right? Did you make any graphic yourself? OL: Can you say some words about your choice of elements? JP: Making any graphic was beyond my skill level. Most of the graphics I used were pretty popular at the time on other sites. I found free collections on other GeoCities web pages and on website builder pages. I picked things that I liked. I really liked the fire graphic a lot! The only thing I slightly made myself obviously was the anti-Titanic webring logo. I went in MS Paint and pasted NO sign on top of the official poster I took from the official Titanic website, I believe. Yes. I think that’s the only thing that I actually made. OL: Let’s talk about your webring! According to the meta data The Anti-Titanic Webring registration page was last updated on the 16th of April 1998. Can it be that is also the date of the webring’s birth? JP: Yes. I think that was probably when the webring was made. 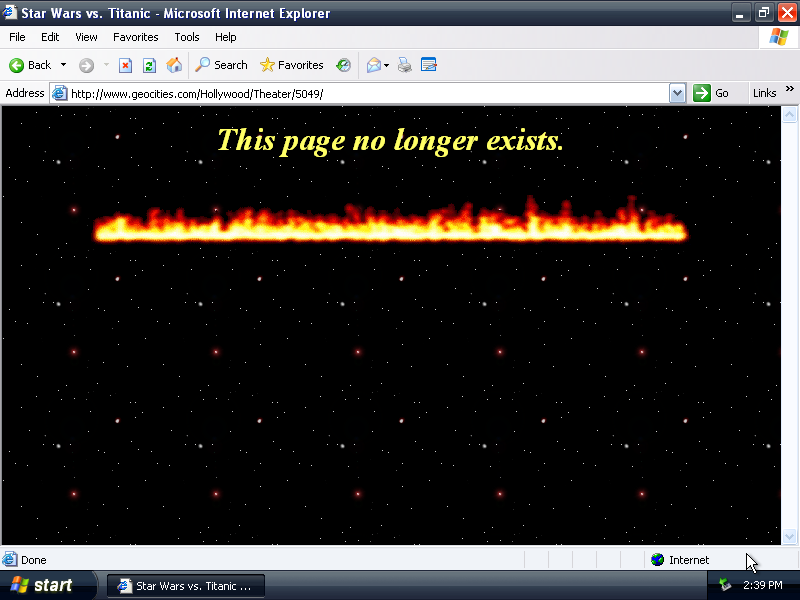 I noticed that there were some other anti-Titanic websites. There wasn’t really a good way then to get more views on your website, which was absolutely what everyone wanted. I had seen web rings before, so I thought, oh, we should make one. There were lots and lots of Titanic webrings. 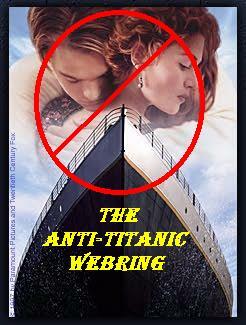 They had lots of different ones that said they were “official.” So I decided to make the official anti-Titanic webring. OL: How many web sites joined your ring? JP: I think approximately 30. I actually did a Google search last night just to see if I could find any, and there’s actually a few that still have my graphic. If you Google anti-Titanic webring the link doesn’t go anywhere, but there are some Angelfire or Tripod sites that still had the ring navigation code at the bottom: Operation P.A.T.H, Titanic the 1997 film: FILTH. I remember they were a lot of fun because they got tons of hate mail too. Okay. He’s Not A Hack. But He’s No Genius Either!, SINK THE TITANIC, A.T.S. (Anti-Titanic Society) . JP: I don’t remember the A.T.S one, but I like the form for guests to leave comments. This reminds me of all the funny emails I would receive. JP: It made me feel important. OL: What were your ringmaster’s duties? JP: People would send me their websites for review. So I would get a lot more websites sent to me than I actually let in because I wanted it to only be websites that had anti-Titanic content within it. And I only would send them back the link of how to be added to it if I added them to the webring. So at least once a week, I would go through websites. And I would try to respond to people that I didn’t add, to tell them why I didn’t add them. Because some people would get pretty upset that I didn’t allow them to be in because “I mean, it’s just a webring on GeoCities.” and “Why are you not letting me in this exclusive club?” So I would try to let them know what kind of alterations they can make up so I would accept them. OL: One person, a Nirvana fan, got a really special treatment from you! OL: You made a page Salute to Ian, where you published your emails to each other. Can you say some words about it? JP: We were 16, we thought it was very funny. Later, I thought, oh, we were being pretty mean. So yes, that was one particular guy and he kept emailing us over and over and over that he wanted to be in the webring. And I started off pretty polite answering back to him. And he just kept asking and asking to be in the webring and I told him that was impossible. And then the tone got nastier and nastier and he was using his father’s personal email to email me, which happened a lot when you were using your dad’s AOL account. It had his full name on there and you could see where he was from. So we said, okay, we went to a map site and sent him a screenshot of the map of his address and said, stop bothering us or… we know where you live. That was one of my friends and I were just, having fun on Friday night… we thought it was funny, of course. OL: Why do you think he wanted to be in the anti-Titanic webring? JP: I really don’t know. I think there are lots of Nirvana rings he could have fed in. I really probably should have let him in because he sincerely hated Titanic enough to send about 10 emails about it. I’m not sure why he didn’t just add something to his page to get accepted. OL: You have a loooong list of people in your acknowledgement section. Who are these people? JP: Yeah. Almost every single person on that page is a friend from school or someone I knew from school, either real name or a nickname that they had. And it was essentially that they had not ever seen their name on a web page before, and they asked me to put it on there. So in the beginning I said, I can’t really do that because that’s not what the page is about. It’s not about school and my friends. But I solved the problem by just making an acknowledgement page. And a lot of the people, most of the people actually, specifically asked to be there. And some of the other people were just friends. I was involved in a student-government thing, and some of those were people I knew from student-government who wanted to be on the web page too. I don’t think, it would be that novel now, but at the time, it was. OL: But none of the names is linked. Were you the only webmaster in your school? Did you think about yourself as a web master at that time, did you use this word? JP: I don’t think I did at the time. But I think I was. And yes I was the only kid who knew how to make a web page. But I remember everyone was very interested in it. We had our own viral marketing campaign for my website. We made flyers about my website and gave them to people. We made buttons, anti-Titanic buttons that you could wear on your backpack. OL: Is there anything left? Any button? JP: I probably still have some… We made a poster one time. I probably have it somewhere at my parents’ house. OL: A poster for your web page, right?! OL: This is how it should be! I hope you can find it and will share a photo with me! JP: I will look for it. (Unfortunately Jennifer couldn’t find the poster, but she send to me a photo of herself in 1998, which you can see on the top — OL) We were trying to figure out what you could do to get more interest in your webpage. It was hard back then. OL: But you did succeed. JP: I would say the website was really popular, whenever Titanic was in the theater, and Titanic stayed in the theater for a very long time. And then I did notice there was a resurgence in people looking at my page around the time—I believe it was May of 1999—when the new Star Wars movies came out. It was when episode one came out. And a lot of people, I think were searching for Star Wars on sites and found mine. So in the beginning, I got a lot of interest for people who liked Titanic. Later on, I got a lot of interests from people who liked Star Wars. So it was an interesting dichotomy. JP: It had its moments that I was very surprised by how popular it was. The counter at the bottom… there were a few days where the Titanic searchers, it was getting several hundred hits a day, which to me at the time, as a personal website, that was really surprising. OL: I didn’t know these numbers, but the updates and your tone made me think that you were in constant and very intense communication with a lot of people. JP: I got a lot of email. I was getting hundreds of emails a day from people, sometimes from repeat people, but usually from different people. Later on, I would maybe not check it for a little while. And then whenever I went back in to check, I would have like 300 or 400 new emails from just people around the world. I mean it was crazy, the amount of email I got. Either saying they liked my page or telling me that I could go and die because Titanic is the best movie ever. Sometimes I would respond, sometimes I wouldn’t, it just depended. I got a lot of just one line sort of things. But again, I had several friends that just would come over to my house and we would just read my email together. We would just have a great time reading the email. It was a lot of entertainment for living in a small town. There wasn’t really anything to do there. 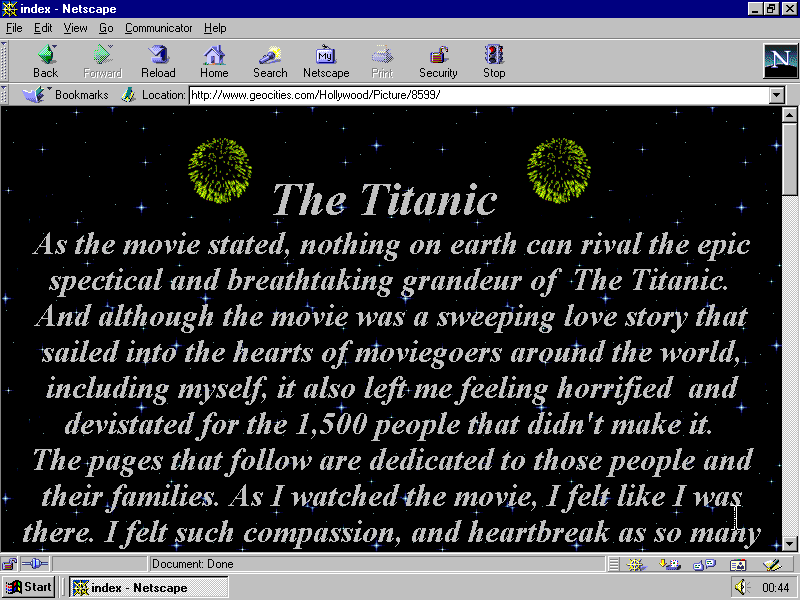 OL: I saw a lot of Titanic fan sites in the Geocities archive. Some of them are Titanic, some of them are Leonardo DiCaprio fan sites. Preparing for the interview I looked through them again and thought that 1998 was probably the moment when this fan base stole outer space wallpapers from fans of Star Wars and from NASA scientists. Before these backgrounds were used for outer space and cyberspace and suddenly, it became the sky over Jack and Rose… you remember, the famous scene when they are “flying” and the final one in the water. I suppose you saw a lot of these sites. Would you say that your website was a parody of such fan websites? Or were you only targeting the film itself? JP: Yes. It was definitely a parody of the fan sites as well. Maybe, initially I didn’t realize it was going to be, but I did like to put my own brand of humor in it at the time. Lots of the websites were very fanatical about how no movie can compare to this one. And so I decided to make mine equally as fanatical, showing you the reasons—even if they didn’t make any sense—that Star Wars was actually better than Titanic. OL: There are two pages that really made me laugh: Do you love my page? and Do you hate my page? There you used all the website clichés of that time. 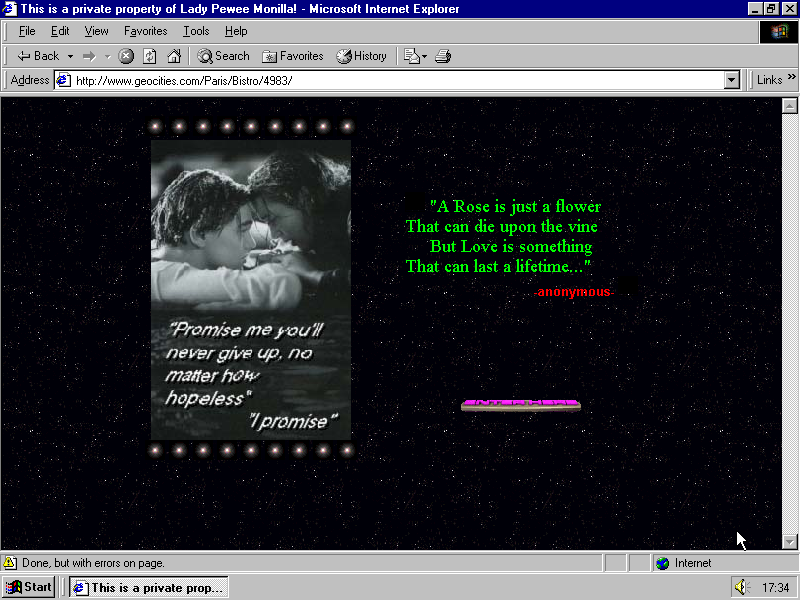 You know if today somebody would want to imitate a 1996 website, this is what they would do. JP: Exactly. Obviously, I had seen all kinds of of websites, where they were either welcoming comments or telling you they didn’t want comments. So I did take a little of the verbiage of every single website and just put it all on there in one big mess. OL: The “Do you love my page?” section is like a lady’s website. Something what you would rather find in the Heartland neighborhood at that time. Was it on purpose? JP: Yes. And that was absolutely the intention. OL: Speaking of mimicking the style, have you seen the Captain Marvel official movie site? People keep sending me this link knowing my interest in amateur aesthetics, but I would like to ask your opinion. JP: Oh wow. I like it. Yes. It looks authentic. OL: Does it look like 16 year old made it in 1998? JP: Yeah. Maybe a little nicer than what I could have made, but yeah, I like that. I like the music in the background too! OL: Why your page didn’t have music in background? JP: My connection was very, very slow dial-up connection. So I didn’t want to have a lot of extras because it slowed the web page down for me. OL: What was your connection at that time? JP: It was just a regular dial-up. Sometimes I was lucky to have like 28kb/s. It was very, very slow. I remember it would take websites several minutes to load. My parents got an extra phone line one day. So you could be on the Internet [constantly] because when we first got the Internet, you couldn’t make any phone calls [and be online at the same time]. I remember my parents would get really frustrated if they tried to call home and the line was always busy because I was on the Internet. OL: One thing about your site is a mystery for me. Everything is 100% early web style, classic GeoCities 1996 website, but you have only one external link! And it goes to the Star Wars drinking game, that I couldn’t find. JP: I thought I saw it the other day. Here! OL: Why did you link to it? And more importantly, why didn’t you link to more web sites? JP: The reason that I did not link to other websites… that’s a really good question. I think I wanted to just write everything myself and since my page was so specific, since it was Star Wars versus Titanic, I didn’t see a lot of websites that I wanted to link to. But for some reason, the drinking game I thought was very funny, and I think that probably had something to do with the United States, you can’t drink at my age here. What are these things? Or was it just a teaser? JP: I really don’t know! I saw that yesterday too and I thought, what? What did I compare? Because I don’t remember this and it looks like I did not follow through. OL: Were you still in high school in ‘99? JP: Yes. I finished high school in May of 2000 and I started college in August of 2000. OL: As it seems next time you returned to your page only in April 2001, to add a quite huge message: “This Webpage Just Got Updated! Hell is Freezing Over!” You left your page unattended for two years and then you came back with the strong intention to make something, right? JP: Yup. I can tell you exactly why. That was because that was when episode two of Star Wars came out and everyone started searching for Star Wars again. And I started getting emails again about the website, so I decided to put something else on it. I was in college, in university at the time, and I just decided it would be fun again. And it wasn’t so fun the second time around, so I didn’t keep it updated after that. I thought I would add some more content to it, but again, my follow through wasn’t great and I didn’t do it. I think I added a little bit, but it wasn’t much. OL: Around that time, did you think that you page was outdated or looked outdated? Did you plan to make it more modern, more 21st century? JP: No, it was like a time capsule for me. I don’t think I had really considered changing it to make it more contemporary just because, I did almost like the nostalgia factor that reminded me of high school. It reminded me of my friends. So there were many, much nicer looking websites by that time, even in just a few years. But no, I didn’t really think about changing it. I kind of liked the clunky nature of it then. OL: From what I know, earlier that year GeoCities discontinued FTP, which would mean you had to use Yahoo’s editor and file managers or pay for the Premium . I also saw a lot of people leaving because they were said that they have to pay for the traffic…. JP: May be. Another reason I know that I left was LiveJournal had gotten popular, and a lot of my friends had made LiveJournal sites. And I made a LiveJournal site around that time. So that was another reason. OL: Are you still on LiveJournal? JP: I still have a LiveJournal. I don’t update it anymore, but it exists. OL: Are you on Facebook? JP: I have Facebook, but I don’t actually like it. I have it because people send event invites that way and it’s a good way to network. But I really do not actively use Facebook. I have it to look at other Facebook pages rather, but I don’t update it myself very often. I don’t really have a niche for an online presence right now. I have Twitter, but it’s mainly to read other people’s tweets. So that’s kind of sad, maybe I need to get active on something. OL: I tried to reach you at boycotttitanic@hotmail.com, but my message bounced back. Did you kill this mailbox or you just forgot about it? JP: I don’t know. I think I must have forgotten about it, probably around 2002 or whenever I left, and I didn’t check it again. I guess Microsoft deleted it. OL: Did your fans and haters notice that you left in 2002? JP: I never checked my email again, so I do not know. That is a really a sad end! Maybe they will see your project and reach out to me again. OL: Btw, on the 28th of February 2019 the screen shot was posted on One Terabyte of Kilobyte Age Tumblr and didn’t go unnoticed! JP: I do have one question for you. What made you try to find me? OL: I always wanted to talk to a Ringmaster!! But seriously I was intrigued by the simplicity and the energy, and authenticity of your site… I think I should try to explain it properly in the introduction. Thank you Jennifer, For your time and your thoughts! And to all the readers out there, if you would like to talk about your home page, contact me at olia@profolia.org!